Kairavini karaiyinile - திரு அல்லிக்கேணி குளக்கரையோரம்: Shocking ! Pazhani idol to Kumbakonam Court - prasadam to be certified !!! Shocking ! Pazhani idol to Kumbakonam Court - prasadam to be certified !!! Many of us go to Temples daily and have darshan of Perumal ~ in this Kali yuga, our Lord blesses us in the idol form (Archavatharam) – devotees offer donations of money, produce, commodity, land, animals and more to the Temples thinking that they are doing their wee-bit for the maintenance of the Temple – sadly, in Tamil Nadu the money flows elsewhere and often used for non-religious purposes and purposes for which the donations were never intended to. The unsavoury incidents getting reported about the maladies in administration would outsmart all that one can imagine as a ‘movie story’ !.. The money in Hindu temples get channelized to various ways of the State which claims to practice secularism – but that applies to only one religion, for Govts often offer more and more sops to pilgrims of other religion. The priests are poorly paid, there are either no infrastructure for pilgrims or the ones are very poorly maintained. Did you read this news item : - As many as 47 major temples in Tamil Nadu run by the Hindu Religious and Charitable Endowments Department will get Food Safety and Standards Authority of India certification for their ‘prasadam,’ an official said today. Prasadam, a material substance of food, is a religious offering and is normally consumed by devotees after offering prayers. The exercise, aimed at ensuring quality and bringing in standardisation, began with the prasadam of the famous Sri Palani Murugan temple’s (Dhandayuthapaniswamy temple) ‘Panchamirtham’ (a mix of banana, ghee, honey, sugar and dates). – one wonders what this is all about ? - is this hotel food ? – while thousands of road side eateries and unlicensed hotels and even rated hotels dish out food uncontrolled, unchecked – comes the beautiful scheme of certification of prasadam.. .. what is prasadam ? - it is that divine food, which is offered to the Lord and partaken by devotees. But in most places, ‘selling of prasad’ is auctioned – those who win the auction, run it like any other eatery – mostly the food is made outside, not offered to Lord and has no sanctity at all !! – yet sold at higher price, for it is sold inside the Temple and the gullible believe it to be the Prasad of the Lord. For saivaites, visit to arupadaiveedu (the six divine places) of Lord Muruga are of utmost importance. Lord Murugan is the deity of the Tamil Land. Palani (Tiru Avinankudi) is the third Padai Veedu. The temple at Palani is an ancient one, situated at an elevation of 1500 feet above sea level. It is a charming campus from where one can take a look at the Idumban Hill, the Kodaikanal Hills, the Western Ghats, the greenery of the paddy fields, rivers, tanks, Palani town and the colleges. On a lovely, clear and mist-free day, the Kurinji Andavar Temple is visible from here against the bright Sun. In daytime, Palani is Hill Beautiful at night, it is Hill Resplendent. Thai Poosam and Panguni Uthiram festivals are very famous festivals and large number of devotees coming here at that time. It belongs to 9th century and the king namely Cheraman Peruman constructed this temple. Palani has been mentioned in the Tamil Sangam Literature as Podhini, which came to be called as Palani later, according to the historions. In Thirumurukatruppadai, Palani is mentioned. Many Siddhas had lived in this region. The idol of Palani Andavar is said to have been made of Navapashanam ( a combination of Veeram, Pooram, Rasam, Jathilingam, Kandagam, Gauri Pasanam, Vellai Pasanam, Mridharsingh, Silasat), by a siddhar called Bhogar. Bakthas firmly believe that the materials of abhishegam like milk, sandalpaste, etc., attain medicinal properties on being poured over Lord Palaniandavars idol and they cure many diseases. Panchamirtham is the specialty of Palani temple. பழனி: பஞ்சலோக சிலை முறைகேடு வழக்கு காரணமாக பழனி முருகன் கோயிலின் உற்சவர் சிலை காவல்துறையிடம் ஒப்படைக்கப்பட்டுள்ளது. வழக்கு விசாரணைக்காக பழனி முருகன் சிலையை கும்பகோணம் நீதிமன்றத்தில் ஒப்படைக்க கும்பகோணம் நீதிமன்றம் கூறியது. பழனி போலீசுக்கு இதற்காக ஆணையிட்டது. இந்த நிலையில் சிலை கடத்தல் தடுப்பு காவல்துறையினரிடம் பழனி முருகன் உற்சவர் சிலை ஒப்படைக்கப்பட்டுள்ளது. பலத்த பாதுகாப்புடன் இந்த சிலை கும்பகோணம் நீதிமன்றத்தில் ஒப்படைக்கப்படும். One shudders to understand ! 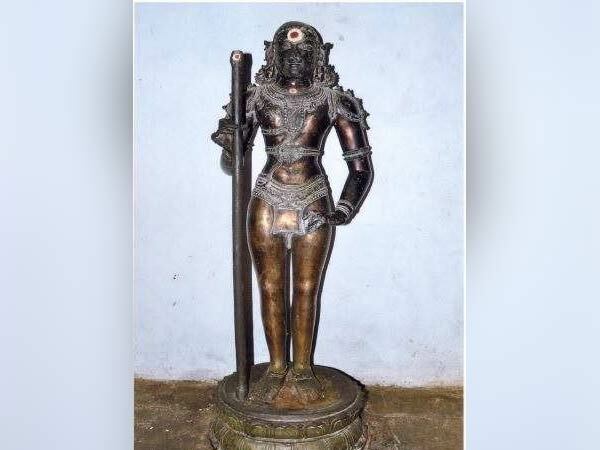 ~ what, what is happening – the idol of Muruga, which is to be worshipped has been ordered to be placed before the KUmbakonam Court and is taken custody by the Police ! ~ what – what a shockwave and pain .. .. how can an idol be taken to Court and in possession of Police – are there not honourable ways of handling this case ?? A couple of months ago, a special police team, led by Inspector-General of Police (Idol Wing) A.G. Pon Manickavel, kick-started its third phase of investigation into the alleged conspiracy behind an attempt to replace the main idol of the Sri Dhandayuthapaniswamy Temple in Palani 14 years ago. This time he came to the temple town with a team of experts from IIT, led by Metallurgy Department Professor Murugaian Amirthalingam, to check the quality and quantity of metals used in the 200 kg idol. The man who has unearthed many temple scandals, interrogated HR&CE Joint Commissioner R. Selvaraj at the PWD guest house. The 200 kg panchaloha idol of Lord Muruga was installed as abishekamurthy near the main idol (moolavar) in the garbagruham of the Sri Dhandayuthapaniswamy temple on January 25, 2004, and removed on June 7, 2004. The management and control of the temples and the administration of their endowments is one of the primary responsibilities of the State . A number of measures have been undertaken prior to the year 1925 for efficient control and supervision of the administration of the Hindu Religious and Charitable Endowments – website of HR& CE claims .. .. .. if there were irregularities, the Dept is to check and weed out them by managing ~ but what is the remedy when such irregularities galore in their administration. In 2004, the then newly-sculpted "panchaloha" idol of Lord Murugan in the famous Sri Dandayuthapaniswamy Temple on the Palani hills was placed next to the 3,000-year-old navabashana idol, to replace the latter since it was "wearing away". However, within a couple of months, the new idol, was removed and shifted to a strong room of the temple. Fourteen years later, officials now suspect that the new idol was sculpted only to "smuggle" the centuries-old old navabashana idol to a foreign land and possibly sell it to an art gallery to rake in crores of rupees, after moving it from the sanctum sanctorum. The idol wing of the Tamil Nadu Police arrested Padma Shri awardee M Muthiah Sthapathi, chief sculptor of the government, and K K Raja, the then executive officer of the Palani Temple, for causing a loss of Rs 1.31 crore in making the statute. Following the arrest of the EO, former commissioner of Hindu religious and charitable endowments - Dhanapal, was named co-accused in the conspiracy to steal gold. Dhanapal is the fifth accused in the case of the alleged misappropriation.